Why are Diamonds Traditionally Used as Engagement Rings? Engagement rings are a well-known tradition within our culture, and they’re an exciting one at that! After all, every girl dreams of the day that the man of their dreams slips a sparkly rock on their finger. However, how often do we stop to think about where this tradition hails from and how it became the star-studded phenomenon that it is today? This is an interesting topic to explore, and below, we delve into the history behind diamond engagement rings. How did terms such as, “a diamond is forever” come to be and how did these lustrous stones gain the prestige they hold today in the wedding industry? Keep reading to find out. The exact origin of the engagement ring tradition in relation to diamonds is not completely known. However, historians have some hunches that they like to cite surrounding the topic. Anthropologists believe that this tradition originated as a Roman custom involving wives wearing rings that attached to small keys. These were meant to indicate their husbands “ownership” of them. Dating all the way back to 1477, Archduke Maximillian of Austria is known to have commissioned the first diamond engagement ring as far as records can tell. This was for his betrothed, Mary of Burgundy. As far as historians can tell, this sparked the trend of diamond rings being a common purchase among European aristocracy and nobility. From there, it became more and more common for men to purchase diamond rings as a symbol of their love and commitment to those they loved. 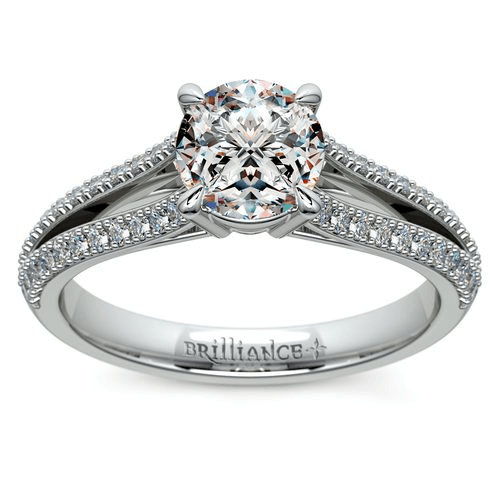 From there, Victorians are cited to have popularized that of ornate engagement ring designs. These commonly featured diamonds mixed with other gemstones, a range of precious metals, and differing enamels. At the time, these rings were commonly crafted into the shapes of flowers and referred to as, “posey rings”. From there through the Edwardian era, the tradition of pairing diamonds with other jewels and commonly mounting them in filigree settings continued. Fast forward to 1948, when the birth of a classic slogan occurred. The ever-popular saying, “A Diamond is Forever” was coined by the company De Beers. This campaign took off in a large way, spurring a large number of sales. Not only did this slogan prove to be catchy and alluring, but it also had alternate meanings that aided in the growing popularity of diamonds. 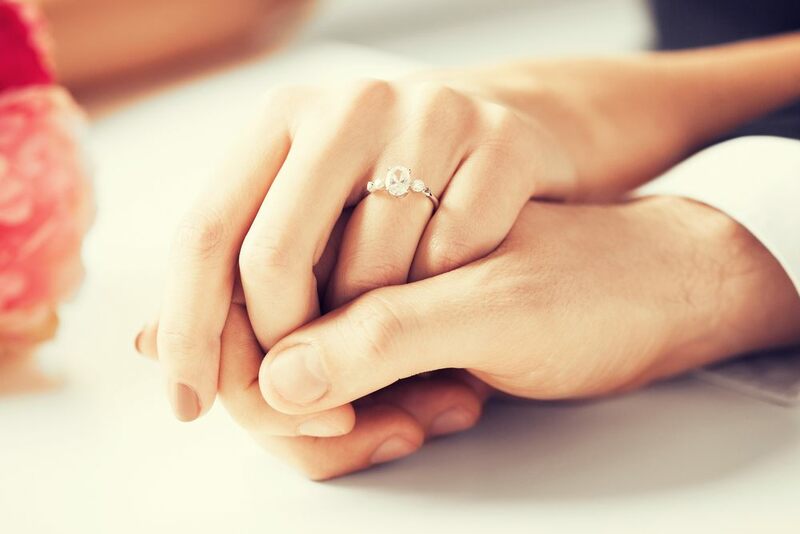 The idea of a diamond being, “forever” conveyed the fact of how durable the stones are, also instilling into the minds of Americans that a marriage is an everlasting commitment. In 1999, Advertising Age proclaimed this saying the “slogan of the century”. This slogan came from a company that worked to make diamonds more accessible, riding the coattails of the 1930s, when the demand for diamonds in America fell due to economic hardships. Prior to the Great Depression, diamond sales had already been on the decline for years, as it was widely believed that these stones were an extravagance reserved only for the wealthy. Along with coining this still-popular saying, though, De Beers featured glamorous movie stars in their advertisements, adorned heavily with beautiful diamonds. Within three years of the campaign, diamond sales had increased by an impressive 50 percent. Perhaps much of the campaign’s success existed in the fact that these advertisements focused on aligning the everlasting beauty of a diamond with the same long-lasting happiness and love that a marriage is meant to encompass. With a focus on permanence and timelessness, images of honeymooning couples or even ads that likened the purchase of a diamond to the founding of a city were circulated widely. It is in De Beer’s ad campaign that the tradition of diamond engagement rings was truly born and took off in society. As early as the 1940s, De Beers annual reports often referenced the, “engagement diamond tradition”, even though that is not something that had yet set fire. However, the more campaigns that focused on that idea, the more the public began to carry on the tradition. In 1951, eight out of every 10 American brides were gifted a diamond engagement ring. Since then, that number has remained mostly static. While the history of engagement rings is not exactly etched in stone, much of its existence can be attributed to the history mentioned above as well as the birth of a slogan that is still revered today, decades after its inception. Regardless of where this tradition came from, though, its one that appears to be here to stay, which is why we love providing couples with affordable, customizable diamond ring options that brides will love from the moment he gets down on one knee, symbolizing his everlasting love and affection.